Know your Points from Picas? Or Colour Spaces from Colour Scales? The print industry uses a wealth of terms to describe the different process, attributes and characteristics that relate to print production. Understanding and using these terms correctly will let you communicate more accurately and efficiently between designers, printers, suppliers and clients. Below are some of the key terms we use on a daily basis when communicating in the design studio and with print specialists. The square around a selected image. ‘Anchor Points’ on Bounding Boxes can be adjusted to distort and reshape the image. Vector lines drawn over areas of an image that are used to isolate that area. With clipping paths applied all other areas of the image are hidden. Cyan, Magenta, Yellow, Key (Black) – The subtractive primary colours used as ‘Process Colours’ in four colour printing. CMYK images should be used for print as each channel correctly correspons to one of the printing plates. Reference cards printed with precise colours to ensure accurate colour reproduction when scanned. 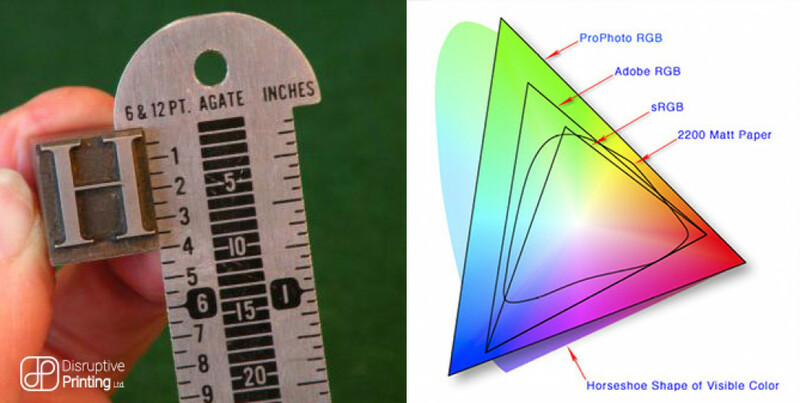 The range of colours that a graphical device can reproduce / display. Dots Per Inch – In print, the higher the better. Higher DPI values ensure more detail is preserved in an image, however file sizes is larger, they take longer to print and use more ink. As a rule of thumb, print images should be at least 300dpi whereas for screen use 72dpi suffices. The bonding of two different paper stocks to form a single substrate with different characteristics on each side. The darkest black produced when all four process colours (cyan, magenta, yellow and black) are overprinted on each other. The sequence and position that pages will print in before being cut, folded and trimmed. Different levels in a digital image that can be manipulated separately – like floors in a building. A typographical measurement that equates to 12pts. There are 6 picas in an inch. A typographical measurement. There are 72pts in an inch. Various tests used in print production to ensure accurate design reproduction. 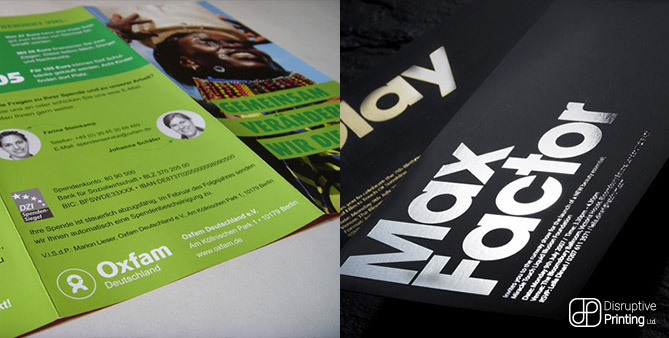 Proofs can be both digital and physical. Digital proofs are suitable for content checking whereas physical proofs should be used to ensure print processes and paper stocks create the desired reproduction of a design. A black obtained when 100% cyan, magenta, yellow and key are printed over each other. Registration black is often used to print Registration Marks. Registration Marks are used to ensure correct plate alignment. Red, Green, Blue – The additive primary colours. RGB colours are used for ‘screen-based’ images such as those on websites. For printing RGB images should be converted to CMYK. The substrate that a job is printed on to. Think we’ve missed out an important everyday printing term? Please let us know and comment below. Got an upcoming print job? Call today to see how we can save you more time, money and effort – 0113 323 1916, or email easy@disruptive-printing.co.uk.